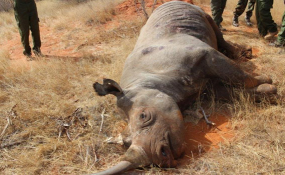 Tourism Cabinet Secretary Najib Balala has suspended six Kenya Wildlife Service officers over the death of 10 black rhinos at Tsavo East Park sanctuary. Mr Balala on Thursday said the officials were responsible for the care of the rhinos that died after being translocated from Nairobi and Lake Nakuru national parks. "According to the inquiry team, the cause of all the deaths was due to multiple stress syndrome intensified by salt poisoning and complicated by the following conditions: dehydration, starvation, proliferation of opportunistic bacteria in upper respiratory tract, gastric ulcers and gastritis," he said. The 11th rhino is in critical condition and could also die after being attacked by lions. The rhinos were also found to have wounds on the legs, neck and lower jaws. The capture and translocation of 11 of the 14 intended rhinos began on June 26, with the first batch of three (two females and one male) captured at Nairobi National Park being moved successfully to Tsavo and held in Bomas for acclimatization. Two subsequent translocations were done on June 29, July 2 and July 5. According to a KWS staff in Bomas, the rhinos were fed on fresh browse, supplemented with lucerne and sugarcane and given water from newly-sank boreholes. However, on July 2, one of the male rhinos began to show symptoms of distress: restlessness and drinking excess water. "Attempts to make it stand were futile as it showed signs of weakness in the fore limbs. "A decision was made to move it out of the Bomas and place it under a nearby shade, where supportive treatment including intravenous fluids was administered," the staff added. The independent inquiry further showed there was negligence at post-translocation, especially while in the Boma. For example, there was poor coordination and communication among the officers involved in pre-translocation studies (biomass, environmental impact and water quality assessments).